In anticipation of healthcare reform and the impact of clinical integration/accountable care on inpatient utilization, Innova helped the client understand the precise number of specialty and primary care physicians needed, through affiliation or ownership, to maintain current inpatient volumes and market share. The Affordable Care Act stimulated hospitals across the country to seek alignment with, or facilitate outright ownership of, physicians. To clearly define their physician demand targets and refine their alignment/ownership effort, the Client leveraged Innova’s long-term role as a trusted and innovative strategy thought partner. 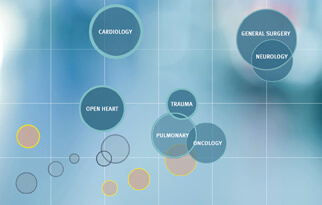 Innova’s creative team conceived of a means to define precise physician demand projections through understanding the physician-to-market equilibrium that exists in a large definable geography, and then documenting access patterns and utilization rates of its service population through the continuum of care. Innova designed a population beneficiary-to-discharge “access tree” and then analyzed the rates at which different age/payer cohorts matriculated through primary care, specialty care, emergency care, and inpatient care. Understanding the precise access metrics between the population and physicians (primary and specialty), physicians and discharges, and existing utilization by age by payer by specialty, Innova created a highly-detailed matrix that facilitated utilization appraisal between a comparably sized population served by a highly-integrated healthcare system and Innova’s study population served by a non-integrated healthcare system. By applying multi-variant post reform utilization targets, Innova projected physician demand using metrics pulled from Innova’s access tree and identified the relative risk inherent in each implementation assumption. This result was a precise definition of primary and specialty care physician demand for 16 specialists by facility by service area and by service line.